British naturalist Sir David Attenborough called on businesses and governments to find a "practical solution" to the issue of climate change, adding that what we do in the next few years will "profoundly" affect the next millennium. "We haven’t yet applied ourselves to this problem with the focus that it requires," he said at the opening ceremony of the World Economic Forum annual meeting in Davos, Switzerland. 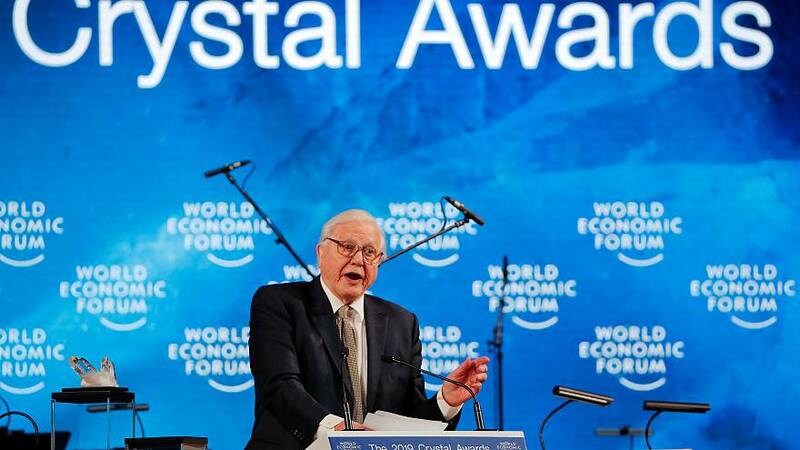 The 92-year-old received a Crystal Award, given to "exceptional cultural leaders" who influence society towards "positive change", according to the WEF website. In his speech, Attenborough said that without action on climate change, civilization would collapse and that it was up to humans to use their "natural problem-solving skills" to find a solution. You can watch footage of Attenborough making his speech at Davos in the above video player. Davos: What's on the agenda for Tuesday?